When Barry and Karen Keagy moved to the Isle of Pines neighborhood in Lake Nona a year and a half ago, they weren’t sure what to expect. After all, they had only recently returned to settle down in the U.S. in 2014 after mostly living in South America for more than 20 years and only coming back to the States occasionally for 3- to 12-month periods. The tranquil suburbia of Lake Nona is a far cry from the Amazonian jungles of Peru, where they invested decades of service as missionaries with Wycliffe Bible Translators. For Karen, Peru has always been home. Karen’s parents moved to Yarinacocha in central eastern Peru in the 1950s as Wycliffe missionaries. The youngest of seven children, Karen was born there. 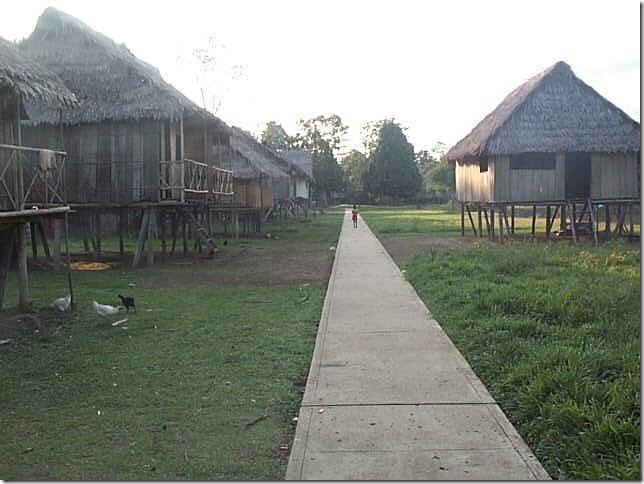 The family settled in a small mission that served the nearby Bora people, an indigenous tribe of the Peruvian Amazon. Karen’s family would travel to the Bora village in Northern Peru via a long boat ride up the Amazon and then through two smaller tributaries. A day in Karen’s life as a child in the Peruvian jungle was quite different from that of most American children in Lake Nona. Her parents made sure she had her first machete by the time she was 4. It was second nature to be on the lookout for venomous snakes. “If our ball fell into the bushes, we’d always poke a stick in first to check before reaching in to retrieve our ball,” Karen says. “I learned to always scan trees for the infamous loro machaco snake.” She had seen one too many people bitten by snakes. “Our friends in the village told us that if we got bit by certain ones, we pretty much had about an hour and a half to live,” Karen says. Karen helped her father build roads and dams, and the family regularly piled into a boat and traveled along the rivers. Karen and her siblings knew to be out of the jungle by dark. At a particular time when jaguars were known to prowl closer to the village at dusk, Karen once sprinted for 30 minutes straight trying to get home before sundown. At that time, none of the kids wore life jackets, much less slathered on sunscreen. “We didn’t have life jackets when I was little, at least not down there, but we all learned to swim really young. Karen celebrates with members of the jungle team after they completed the Kashinawa New Testament revision with portions of the Old Testament before sending it for layout and printing. It was just a different time,” Karen says. One time when their boat hit a log that caused a hole, Karen’s father handed the children gum to chew up quickly to plug the leak. None of this fazed Karen. “Actually, I was more nervous when I moved to the States at 18 to attend college and live on my own because I didn’t know what to be cautious of,” Karen says. Leaving the jungle brought Karen to Tulsa, Okla., where she attended Oral Roberts University. It was there that she met Barry Keagy, who grew up in California. Barry earned a B.S. degree in Business Administration, and Karen received a B.A. in Elementary Education. After graduation, Barry went to Peru for the first time. “It was at the mission center where I realized that you didn’t have to be a preacher or church planter to be a missionary. All skills and expertise were needed. You could be an accountant, like me,” Barry recalls. Karen Keagy with her second – through fifth grade class in Peru. She took her students fishing on the last day of school. They caught mostly piranha! An opportunity arose with Wycliffe Bible Translators to work as short-term assistants at the mission as a bookkeeper and teacher. The Keagys decided to move to Peru in September 1993. The idea was to go for one year. “We ended up staying for 21,” Karen says with a smile. Five years into their mission, Wycliffe’s leadership asked Karen and Barry to make a critical decision. Would they continue their service as career members or return to the States? “I just couldn’t imagine simply using my business and accounting skills just to provide for my family when I could also use them to provide God’s Word to others,” Barry says. Barry provided accounting and computer support at the center and later served as director of jungle operations. 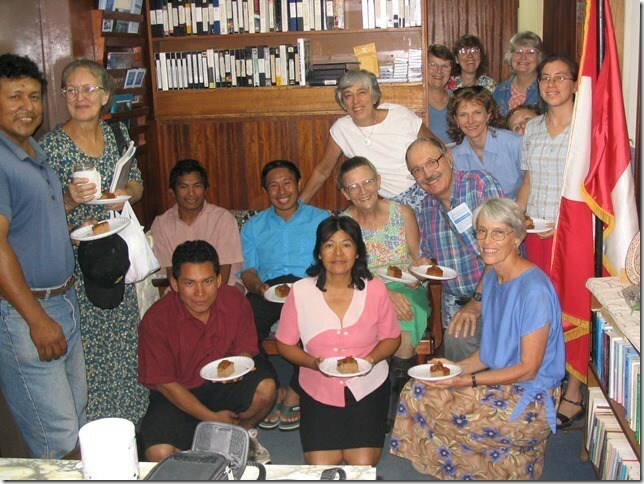 Karen served as center hostess and taught school to the missionary children. Along the way, they welcomed another son, Levi. The couple moved to Lake Nona in February 2015 to serve at Wycliffe’s USA headquarters located off of Moss Park Road. Barry serves as the director of corporate accounting, and Karen assists in a variety of departments. This was Karen’s childhood home in the village where she spent her summers. While there is still no electricity or running water, the village now has a sidewalk. Karen and her siblings had to walk in the mud when they were kids here. Thanks to technology, it is much easier to stay connected. The Keagys use Facebook to keep in touch with their goddaughter in Peru, their adopted grandchildren from their goddaughter, and their friends from their home church in Lima. These days, they aren’t worried about jungle snakes anymore. Being in the States allows the Keagys to visit their three children and two grandsons more than they would be able to do if they were still in Peru. The Keagys still get to practice their Español at a Spanish-dominant church, New Covenant, based in Taft. They enjoy picnicking after church and hiking in Moss Park and Split Oak Forest Park. If they get a hankering for ceviche or lomo saltado, they drive over to their favorite Peruvian restaurant, Taste of Peru, on Orange Blossom Trail. 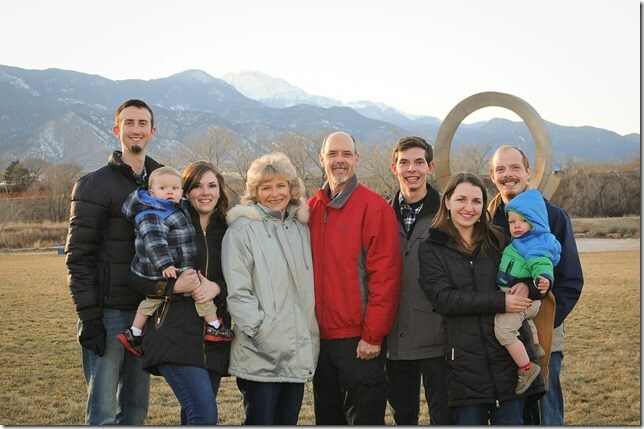 Karen and Barry (center) surrounded by their children and grandsons. In 1942, a missionary named William Cameron Townsend founded Wycliffe Bible Translators to help people around the world translate the Bible into their own languages. The non-profit also helps with language development, literacy, and other spiritual and physical needs. Lake Nona is not only home to Wycliffe USA’s headquarters but also the Discovery Center, an interactive experience sharing Wycliffe’s story and impact. The center is home to a museum, village shop and café. Open weekdays from 9 a.m. to 4 p.m., the Discovery Center is located at 11221 John Wycliffe Boulevard. For more information, visit wycliffe.org/discovery-center or call (407) 852-3856.